Combine water, honey and ginger in a medium saucepan over medium high heat. Bring to a simmer. Add fruit wedges, toss to coat, cover pan. Allow stone fruit to gently simmer (stirring occasionally) for about 5 minutes, or until the fruit is tender but still retains its shape. Taste for sweetness and stir in additional honey, if you desire. Transfer compote to a lidded container, let it cool to room temperature, then refrigerate. 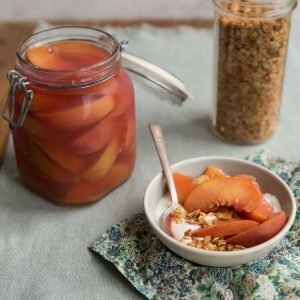 Serve compote with granola and yogurt for a delightful breakfast or over vanilla ice cream for a luscious dessert. Makes 4 cups ~ Compote is best eaten within a week.